Every once in a while, something odd happens. I’m compelled to buy a toy that I know nothing about. My friends might tell you that it’s not that odd an occurrence, but I promise it is. The reasons vary. First, she’s a robot girl. If you’re familiar with my reviews, you’ve probably noticed I’m a sucker for robot girls. Second, just from the solicit pictures, you could tell this figure had a cuteness about her. Sure there are a lot of good looking toys out there, especially from Japan, but Aegis had something most toys lack. Somehow, Figma was able to imbue this figure’s looks with a sense of personality. Aegis is a supporting character in the video game series, Persona. She first appeared in Persona 3 and proved popular enough in Japan to receive her own cell phone game. You can tell from her strange appearance that she’s not quite human. She’s an android. I’d like to tell you more about her than that, her back story for example, but I can’t. Aegis comes from a very lengthy RPG that I’ve never played, so when doing research about her character, I was overwhelmed by the back story of the game itself. Me, trying to describe it to you, correctly, would be equally frustrating for both of us. So, if you really want to know more about her, check her out on Wikipedia. I mentioned here sense of life in the intro, and I think part of that comes from her poseability. 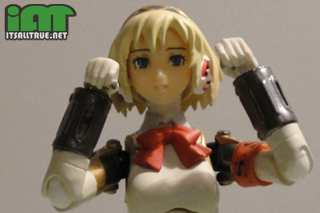 She has ball-joints for her head, shoulders, upper torso, wrists, and thighs. And she has hinged elbows and knees. But, in my opinion, what really gives her that spark of life are her three interchangeable faces. One is happy, content, and playful. The second is serious, determined, and a little angry. The third is innocent, concerned, and a little intrigued. That’s one of the best qualities about this figure. Depending on how her head or body is positioned, or even how the light may be hitting her, she is able to give a wide range of emotion because of these three faces. Looking over my toy shelves, I don’t see many other figures that have the ability to change their expression so effortlessly. She doesn’t have feet, at least not in the traditional sense, but Figma made up for that with two specially designed stands that plug into the bottom of her hooves. Each clear piece of plastic acts like a high heeled shoe that holds her up while being mostly unnoticeable because of their small size. In my opinion, they’re perfect. I wish there was a way to give all figures such unobtrusive stands. But, there’s more. If you want to pose her in a flying or action pose, they included their classic translucent display stand which can plug into her back. 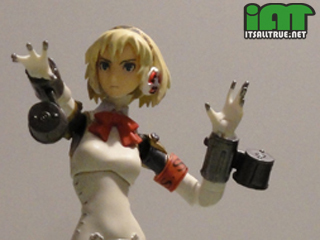 Aside from her three faces, two stands, and ten alternate hands, Aegis also comes with three other accessories. First up, there are two small canisters that attach to her wrists. In the game, she can shoot bullets from her fingers and these canisters act as ammo clips. 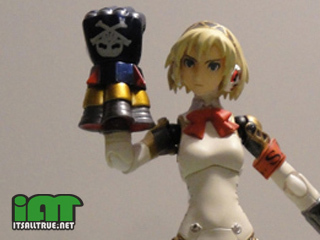 She also comes with a giant fist adorned with a skull. This is her rocket fist that she can shoot at enemies. Oddly, they made the fist part separate from the rocket part, so she could just wear a giant fist if you wanted. I paid about thirty dollars for my Aegis and she is worth every penny. She’s one of the best toys I’ve owned and is easily in my top ten favorites right now. If you want to buy her, hit up all the stores you trust first. You’d probably get the best deal there. But, she did sell through a couple of runs rather quickly, so you may have to go eBaying for it. If you can find her at a decent price, I’m sure you’ll be happy with her. And the coolest thing about figures of robots is that visible articulation just makes them more authentic. So true. It’s one of the few times the joints actually work for a figure. how would you say she holds up, durability wise? she looks fragile. does she feel as good as a revoltech at least? i bet her limbs don’t have any DCUC style warpage though. She’s durable. Her limbs are all solid, none of that gummy plastic that Matty uses, so they don’t bend or warp. 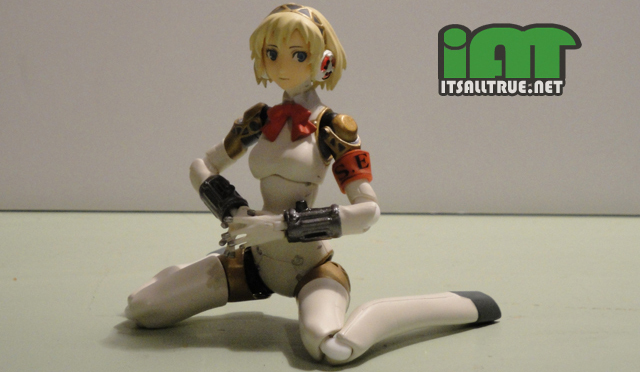 She’s basically comparable to a Revoltech. 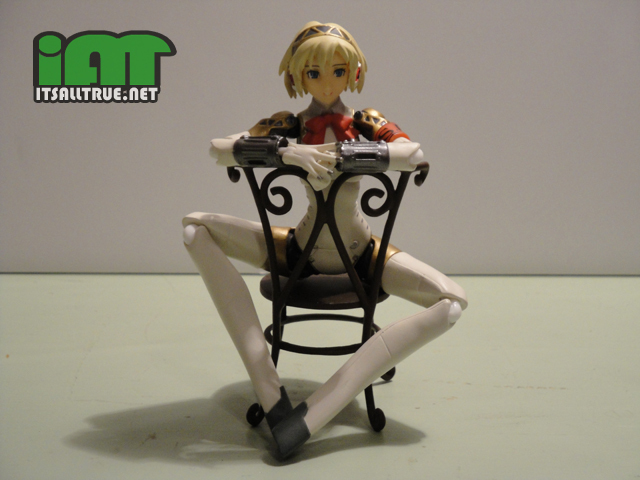 The only thing I would consider a problem was that her cut thigh joints are a little tight. With a little work they can be loosened up enough though. I didn’t know they were made of nylon, thanks for the info. I wonder if you could do something like that in the US, only as a “Collector” line. Kind of like what Mattel is doing for He-Man, only really meant for adult collectors, and not just an excuse to sell things at a higher price but without the higher quality. I always find it frustrating that I can get a figure from Japan for just a little more money than a MOTU Classics and the quality/articulation/paint is lightyears ahead of what Mattel is doing. I find it reassuring. 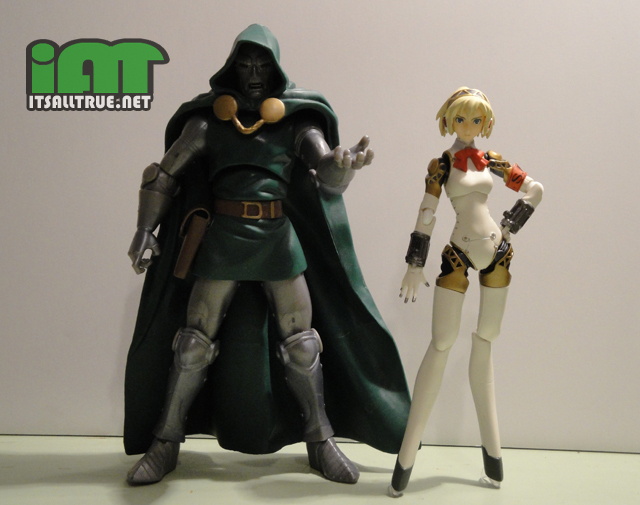 When I look at the one revoltech and one figma I have and think about how they each cost well over $20, it’s nice to have something to compare them favorably to. Interchangeable faces, display stands, an emphasis on poseability without sacrificing aesthetic, and solid design from top to bottom; everything works. This is what premium figures should be. I’d say the closest American equivalent was SotA’s Street Fighter, and those would realistically cost about what these and MOTUC do if the same toys were made today. The last picture sells this review.